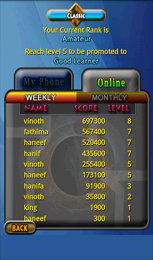 Awesome puzzle game with addictive game play and online game scores. 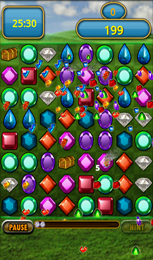 Jewel Magic adds several creative innovations to the already very popular match game concept with four differently themed game modes and unlimited levels of challenging fun. All game modes have individual player ranking system based on the highest level/Score achieved. 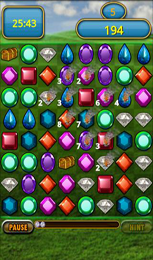 Jewel Magic has four interesting game modes as below. 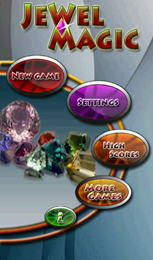 Jewel Magic Classic : Move timeout based addictive game. JewelMagic Time Attack : Tests your raw gem matching speed. 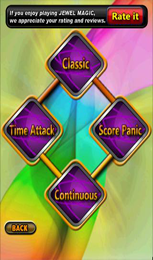 Jewel Magic Score Panic : Very dynamic fast paced game. 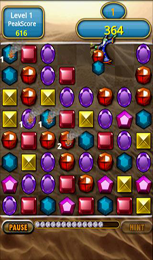 Jewel Magic Continuous : Non stop gem matching fun. Awesome graphics with fluid animations. Auto saving & loading for all game modes. Magician clears all surrounding gems by matching two similar gems adjacent to him. 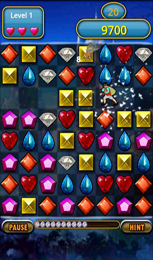 Sack man clears gems in a row or column by matching two similar gems adjacent to him. Smoke! Beware of them. Clear them before the move out counter in each smoking gem reaches zero or else it will spread to your adjacent gems. Unlimited levels! It needs only your skill to crack a new level. Complexity of the game increases progressively from level to level. Could you ever reach Level10 in Classic/Score Panic game mode? Well, let's see!!! Copyright © 2012 iGoldtech.com All Rights Reserved.